Jesus was a refugee. He is a stranger, hungry, thirsty, and displaced. In our time. In our world. While Norwegians recently have been celebrating Easter and enjoying the sun, awful incidents have been taking place in Syria. So far, at least 12 000 children have died in the Syrian war. 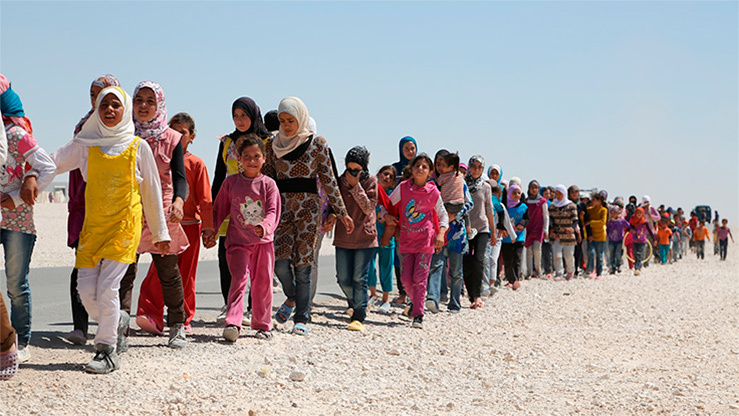 In the global context, 22 million children are displaced. They are from Syria, Yemen, South-Sudan, DR Congo, Afghanistan and other countries. There are 65 million refugees and displaced persons in our world today, the highest number since the Second World War. People flee from war, persecution, poverty and natural disasters exacerbated by climate change. Europe is paralyzed by increasing xenophobia. Fences are put up. Most refugees and other migrants are prevented from continuing their journeys. The refugee crisis is not taking places in Norway. Last year we received around 3000 refugees through UN resettlement. Refugees are coming to Greece, Italy, Lebanon, Uganda, and other countries neighbouring conflict areas. Many congregations in Europe and Norway have been practicing neighbourly love and have established safe spaces for refugees and other migrants. Our faith and our lives have been challenged and enriched through these encounters. Many have advocated for the basic human rights of refugees, such as Norwegian Church Aid, providing humanitarian assistance in Syria, South Sudan, and other countries. Through the Lutheran World Federation, the Church provides assistance to almost 3 million refugees and displaced persons annually. As part of the human family, we have a responsibility for suffering human beings, even when taking action is costly. The church is a movement of hope. The church must be a protest movement against injustice. There are many people living in fear, but the resurrected Jesus said to his disciples: Fear not! Be courageous! In a suffering world, the answer lies not in distancing ourselves from suffering and building walls. The church cannot accept that! Welcome the stranger! Be the voices and hands of hope! Be courageous, and engage yourselves in local communities and in public discourse! Be brave! Show hospitality in words and deeds. Ensure a decent public policy towards refugees and asylum seekers. Whatever you do for one of the least of these, you do for me, Jesus told us. The Church of Norway General Synod meets annually. The Synod consists of the members of the diocesan councils, as well as representatives from the Sami Church Council. A majority of the 116 delegates are lay people.